We are a leading Exporter of automatic bituminous compactor, benkleman beam, bituminous asphalt mixer, centrifuge extractor (motorized), core drilling machine (motorized) and ductility testing apparatus from Ambala, India. 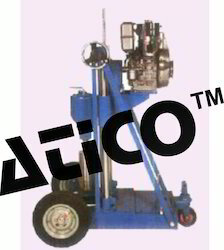 Advanced Technocracy Inc. is Manufacturer, Exporter & Supplier of Automatic Bituminous Compactor. In flexible pavement construction, bitumen binders are used. It is important that bituminous material forms ductile thin film around the aggregates, which serves as a binder. The binder material not of sufficient ductility renders pervious pavement surface and leads to development of cracks. Therefore it is important to carry out the ductility tests on bituminous material. Ductility is defined as distance in cms. to which a standard briquette of bitumen can be stretched before the thread breaks. The briquette is stretched at a rate 0 0 of 50mm/minute +/-2.5 mm per minute at a temperature of 27 C+/-0.5 C.
Specifications: The apparatus consists of a Water bath with a thermostatic heater, and a circulating pump to maintain uniform water temperature. One half of the briquette moulds in fixed on a fixed plate in the water bath, the other half of the briquette mould is fixed to a carrier which slides over a rotating threaded shaft with a clutch. The motor and gears to rotate the shaft are housed in a cabinet fixed above the other and of the bath. A pointer fixed to the carrier moves over a scale graduated from 0-110 cm x 1mm fixed on the bath with “0”(Zero) of the scale towards the fixed plate slide. The rotating shaft has 2 speeds of travel for the bracket, 5cm/min. and 1cm/min. selected by a clutch. Water bath inside is aluminum, it is an insulated water bath. Water bath is provided with a drain. A heater with thermostatic control is fixed inside the water bath. 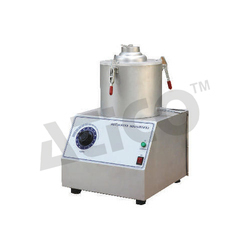 Control switches for motor, stirrer, heater and indicator lamps are fixed at a convenient place on the water bath. Complete with three briquette mould and one base plate, all made of brass. 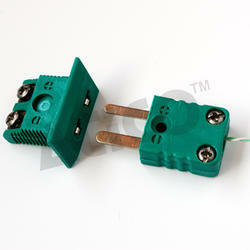 Operates on 230Volts A.C. single phase. Advanced Technocracy Inc. is Manufacturer, Exporter & Supplier of Benkleman Beam. This device was developed by U.S. Bureau of Public roads and is used to measure deflections of flexible pavements. 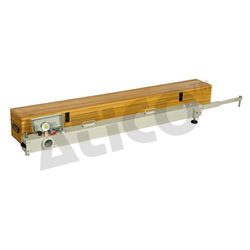 The light weigh instrument is supplied in two path for assembling on site with easy hand tools. In use one end of the beam rests at a point under investigation while the beam is pivoted at the centre. The free and carries a dial gauge to record the deflections. The other end is kept on a stable platform. The beam ratio is 2:1 which magnifies even small deflections. Supplied with a dial gauge 0.01 to 25mm. This is a lift weight dismantle able instrument and easy carry. 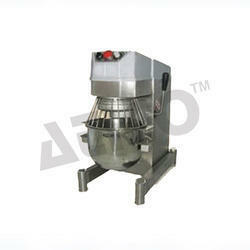 This mixers are suitable for mechanical mixing of hot-mix bituminous mixtures. It is designed according to the description in specification of the Stage of California Test Method 304B. And or uniform mixing of Bituminous and Asphalt mixing. The stainless Steel mixing bowl has the capacity of 5 liters. The pedal, also of a stainless Steel, can have both planetary and revolving motion for uniform mixing. In operation the paddle is rotated at two speeds I.e, low and high rpm to agitate and mix the mixture vigorously with the aid of the spring steel baffles also inserted in the bowl. Furnished with an electric heating arrangement for maintaining the temperature during the mixing period. Operated on 220 volts, 50Hz., Single phase AC supply. Advanced Technocracy Inc. is Manufacturer, Exporter & Supplier of Centrifuge Extractor (Motorized). Advanced Technocracy Inc. is Manufacturer, Exporter & Supplier of Core Drilling Machine (Motorized). Suitable to cut/Drill cores of Concrete, Rocks, Stoned, Tiles or the similar material. 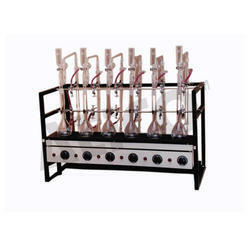 The machine is suitable for core samples of size upto 150mm diameter. With the help of thin Walled Diamond Bits which are at extra cost. The machine has sturdy base with pillar support in which rack and pinion is provided for adjustment in height and penetration assembly. The leveling screws are provided at the base. Fro gripping the sample in position suitable grips provided. A suitable electric motor, standard make is fitted in the machine with cooling arrangement with water. The base frame is also fitted with wheels for ease fo transportation. Drill Speeds 900rpm for soft samples and 350rpm for hard samples. Suitable for 230 volts AC, single phase. Advanced Technocracy Inc. is Manufacturer, Exporter & Supplier of Ductility Testing Apparatus. In flexible pavement construction, bitumen binders are used. It is important that bituminous material forms ductile thin film around the aggregates, which serves as a binder. The binder material not of sufficient ductility renders previous pavement surface and leads to development of cracks. Therefore it is important to carry out the ductility tests on bituminous material. Ductility is defined as distance in cms. to which a standard briquette of bitumen can be stretched before the thread breaks. 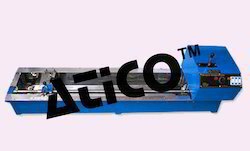 The briquette is stretched at a rate 0 0 of 50mm/minute +/-2.5 mm per minute at a temperature of 27 C+/-0.5 C.
This new apparatus automatically simulates hand compaction as specified in Resistance to Plastic Flow of Bituminous Mixes) and develops a uniformity in the test procedure. Supplied complete with operating frame, standard compaction hammer assembly, motor and controls, and compaction pedestal. The new Automatic Bituminous Compactor will accommodate one standard bituminous mould at a time. The mould are held in position by a quick clamping device so that are easily inserted and removed from the apparatus. The apparatus features a new design in the lift and release mechanism to develop uniformity in the height of the drop of the hammer. The basic design of the hammer is the same as that used for the hand compaction procedure. The 0 hammer is free to rotate on the guide shaft for a full 360 to eliminate friction in the drop. The unit is supplied with an automatic counter which can be preset for 50 or other specific number hammer drops after which it will automatically by shut off. Powered by a 1/2 Hp motor, the new Automatic Bituminous Compactor is avaiLable for 220 volts, 50Hz, AC operation. The compactor is supplied with the standard base pedestal which consists of a 300mm x 300mm x 25mm thick steel plate mounted on an 20mm x 200mm oak block . 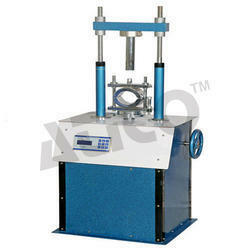 Advanced Technocracy Inc. is Manufacturer, Exporter & Supplier of Marshall Stability Test Apparatus. Generally the test is applicable to hot mix designs using bitumen and aggregates upto a maximum size of 25mm. In this method, the resistance to plastic deformation of cylindrical specimen of bituminous mixture is measured when the same is loaded at periphery at 5cm per min. This test procedure is used in designing and evaluating bituminous paving mixes. The test procedure is extensively used in routine test programmers for paving jobs. There are two major features of the Marshall method of designing mixes namely. a) densityvoids analysis, b) Stability-flow tests. The Marshall stability of mix is defined as a maximum load carried by a 0 compacted specimen at a standard test temperature of 60 C. The flow value is deformation the Marshall test specimen at under goes during the loading upto the maximum load, in 0.25 mm units. In this test and attempt is made to determine optimum binder content for the type of aggregate mix and traffic intensity. 1) A loading unit motorized, capacity 5000kgf with two telescopic pillars and adjustable cross head. Limit switches are fitted inside to control upward or downward movement of the pillars. On-off reversing switch and indicator lamps are on the front side while a hand wheel to manually move the pillars is on the right. The load frame has fixed speed of 5.08cm, per minute. Operated on 230 Volts A.C.
4) 1 No. Breaking head assembly with provision to fix flow meter. 5) 3 Nos. Specimen mould 10.16 cm I.D. x 7.6 cm high with base plate and extension collar. Accessories: (A) Integral type proving Ring capacity 3000Kgs. (B) A dial gauge 0.01 x 25mm. (C) Universal water bath S.S with false bottom and pyramid shaped lid to accommodates 3 Nos. Marshall specimen. (D) Thermometer 0-250 C x 1 C.
Advanced Technocracy Inc. is Manufacturer, Exporter & Supplier of Standard Penetrometer. For testing a wide variety of materials such as grease, bitumen, tar wax, polish, food stuff, rubber, asphalt and pharmaceutical creams. By applying a given force over a given period of time depression is made in the sample which may be measured in tenths of a millimeter and expressed as a penetration number. Consisting of a head support, mounted on a vertical rod which can be adjusted four height. A rack and pinion and pointer assembly provides fine adjustment of needle or cone tip to sample and incorporates slipping clutch mechanism which makes reading penetration subsequent re-setting a simple and accurate operation. The dial is graduated from 0400 in one tenth millimeter sub division. Complete with plunger and weight of 54 gms. (a) Without cone or needle. (b) Cone for use with the above. (c) Needle for use with the above. Advanced Technocracy Inc. is Manufacturer, Exporter & Supplier of Thermo Couple Copper Contantan. One each wires copper and constantan approximately 305 mm long, twisted and brazed together. 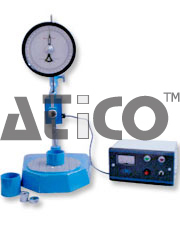 Advanced Technocracy Inc. is Manufacturer, Exporter & Supplier of Bitumen Automatic Penetrometer. Consists of a Head Support, Mounted on a Vertical Rod Which Can Be Adjusted for Head, a Rack & Pinion and Pointer Assembly Provides for Fine Adjustments of Needle or Cone Tip to Sample Incorporated a Slipping Clutch Mechanism Which Makes Reading of Penetration and Subsequent Resetting a Simple and Accurate Operation. the Penetrometer is Provided with Automatic Timing Control Device.time for Penetration is Automatically Controlled.the Plunger Release Can Be Operated by Hand when Desired.the Dial is Graduated from 0- 400 in 1/10th Mm Sub- Division. Complete with Penetration Needle, Set of Cups & Weight of 50gm and 100gm. 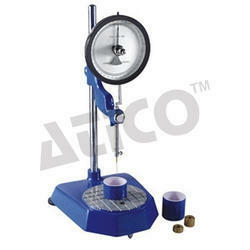 Looking for Bitumen Testing Equipment ?